I have nothing but excited to read Shatter Me by Tahereh Mafi since I've read nothing but amazing things about it since its publication. 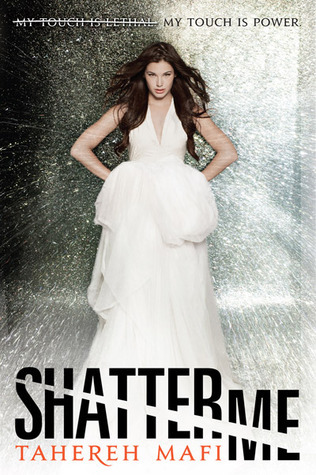 I had pretty high expectations for the book based on the heaps of praise given to it by other book bloggers whose judgement I trust ... and yet, I read Shatter Me and while I loved the touch me don't touch me angst between Juliette and Adam in the first half of the novel, I still felt a bit emotionally disconnected to the story and to the characters. The first few pages of the story really grabbed me. I loved unfolding this strange story of a girl who has been locked up in an asylum for causing untold harm on others. She hasn't spoken in 264 days and while she craves the touch of others, she also avoids it entirely for fear of what will happen. As the story goes on, I was further intrigued by what little personal history she shares with Adam, the boy who comes to share her cell and of the horrors of this future world. I think the thing that caused my emotional distance from the storyline as I continued reading were twofold. The first is the way in which it is written. I quite like the stark, honest and at times beautiful way in which Juliette narrates the story by the things she jots down in her notebook. It seems to work quite well as she is confined in her cell with nobody but Adam for company and plenty of time on her hands. But further in the story in when there is more action and dialogue and cameras trained on her for a large portion of the day, I didn't feel that Juliette writing in her notebook was really the most believable way in which the story is passed along to us. The other thing that held me back from loving Shatter Me in its entirety is the relationship between Juliette and Adam. Here is another instance in which we are told much of their past history and the reasons in which these two have become attracted and drawn to each other, but in the present day we don't see a huge deal of them getting to know who they are as people now and I would have liked to have seen more of that. All well and good holding onto strong memories of childhood and of people who have made an impact on us, but that doesn't necessarily equal love when two people meet years later. I really liked Juliette as a character. She's dealing with a lot. The rejection of her parents is difficult, the way in which she has been treated her entire life, the guilt that she carries around for the things that have happened in the past. Juliette holds on to all of these things and more and it's a wonder that she isn't more emotionally damaged than she is. And yet still she holds onto her goodness and her strong beliefs towards not using the power she has at all if it means hurting others. The world that has been built for Shatter Me leaves me very interested, especially now that battle lines have been drawn, Juliette has chosen her side and that we've learned a bit more about her powers and how they fit into this new world. I'm intrigued to know more! Hmm, I'm intrigued by this. I love the sound of Juliette's narration. I've been wanting to read this book for ages cant believe I haven't gotten around to it yet but I'll have to soon, thanks for the review!